#WALKIN_ALERT :- Randstad hiring Freshers for Chat Process- Oracle India ! Hiring fresher and experienced- 2015 batch (preferred) and 16 batch (can also apply). BE/B.Tech (CSE/ IT/ IS/ ECE), MCA from 2016 batches with 65% throughout academics. **Candidates need to undergo training or have done live projects on Dot Net will be preferred. As an Associate Software Engineer you will be a part of the Epicor India Technology Centre (ITC) Product Engineering team, at Bangalore, and you will be responsible for interpreting and writing software requirements/design specifications to develop, debug, test, and maintain software and applications to be deployed on multiple platforms. This is a great opportunity for you to gain domain expertise in software that supports and delivers growth to the Manufacturing, Distribution, Retail, or Service industries. Your possible projects include developing and enhancing functionality, web-enabling products, or extending our mobile and SaaS / Cloud offerings. As a member of Epicor’s Team you will be based in our recently opened India Technology Center, so you will take part in Epicor’s next success story from the very beginning as we are building up our new tech campus in Bangalore. You will work within a friendly software engineering team and work on a number of critical products and projects. As a member of the Epicor Development team you will develop and maintain one or more of the Epicor products. Possible projects include enhancing functionality to help us keep our competitive edge, leveraging both ASP.NET and web development. Development for both desktop and mobile application will be a part of your new role. Able to quickly understand existing projects and new requirements. Understanding of design patterns, principle and Object Oriented Design. Will work as an Associate Software Engineer under Epicor products. We offer a clear career path within the Product Development function with opportunity for further career advancement. At Epicor you can reach your full potential because growth for you means growth for us. Work Location: Corporate - India Design Center Bangalore. This position is for Environmental & Engine Control System at Global Engineering Center – India. Bangalore. Circuit simulation and Timing analysis. Doddanekundi Circle, Outer Ring Road,Marathahalli Post, Bengaluru 560037. 6. Microacademy : ITIS-Service Helpdesk Domain - 2014, 2015, 2016 BE/B.Tech Only. Candidate have to source relavant profiles form job portals, social media. Need to update the profile in our recruitment tool / ATS. Candidate willing to work in rotational shift. 1- 6 Months exp in sourcing profiles / Data Entry. Knowledge in recruitment or sourcing is good to have. 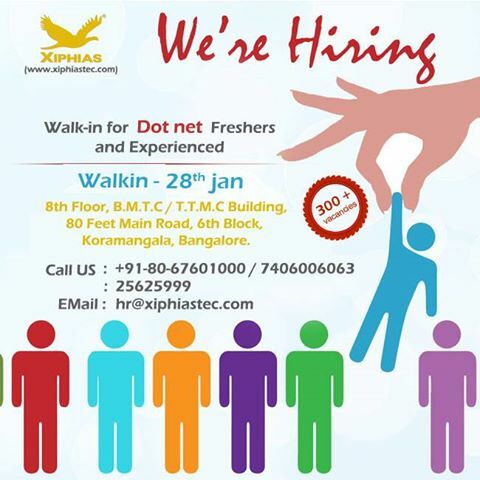 Interested Candidates can walkin to below venue on 27 Jan 2016 (Friday) between 11:00 AM to 3:00 PM. 4th floor, Tower B,brigade tech park,near ITPl,bangalore. Contact person: jeevia priya sarah. Write down this on top of ur resume. We have excellent job opportunities for Retail Banking Professionals for Process associate Level at Capgemini Bangalore. If you are interested to apply and have experience in Retail Banking or Banking Operations, please walk-in to the below mentioned venue. Interested candidates can walkin on 24th – 27th January 2017 at 3 PM with updated resume and any ID Proof. Walk-in details: Date 27th Jan to 31st Jan 2017, starting Time 11:30AM.